Doughnut charts display data in rings, where each ring represents a data series. Doughnut chart are functionally identical to pie charts, the only difference is that it has a hole in the middle. Doughnut charts, also called donut charts, are best used to compare the size of a particular slice with the whole, rather than comparing individual sections of the donut chart with each other. Doughnut charts are very widely used in the business world and the mass media. 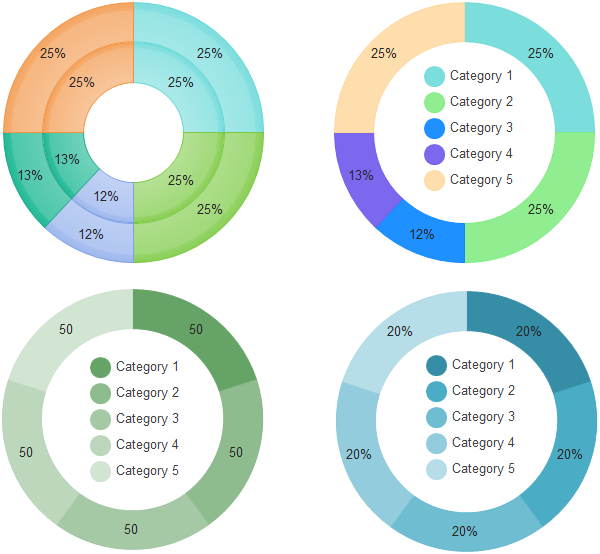 With doughnut chart maker you can quickly turn your data into a doughnut chart, and then use the floating button tool to make that doughnut chart easier to read. 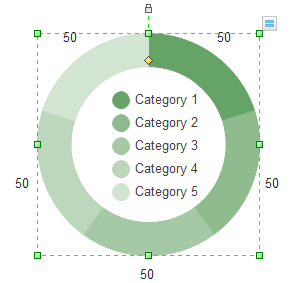 For example, by adding a legend, data labels, and text boxes that point out what each ring of a doughnut chart represents, you can quickly understand the data that is plotted in the chart. There is something you should pay attention to when using doughnut chart. It must be clear what the sum of the donut chart stands for. All the pieces must add up to 100%. There should be fewer than seven categories or sections. The sections of the donut chart should be labeled because angles are hard to judge. Doughnut charts are generally used to show percentage or proportional data and usually the percentage represented by each category is provided next to the corresponding slice of doughnut. It is quite an easy job to draw doughnut chart via doughnut chart maker. Now we will show you clearly how to draw a doughnut step by step. First things first, select a doughnut shape you like from pie and doughnut shape in the library which is on the left of the canvas. Drag and drop the doughnut shape you have chosen on the drawing page. Find the floating button on the upper right of the doughnut shape like the picture below shows. There are many options on the floating button. For example, you may add or delete categories, you may set category number, hide data labels. Also, you may set the doughnut thickness from 10% to 100%. 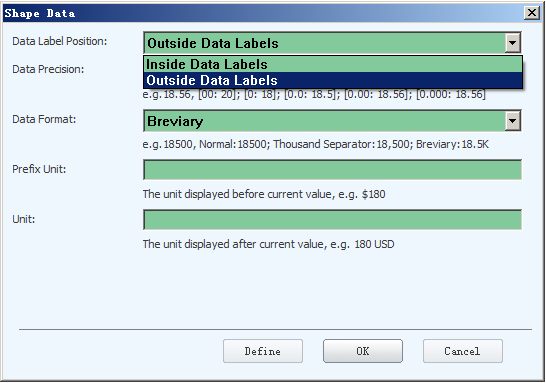 When you click the option "Data Label Options", you may find that the below window. When you choose to set outside data labels as the picture shows above, the final result is like the picture below. 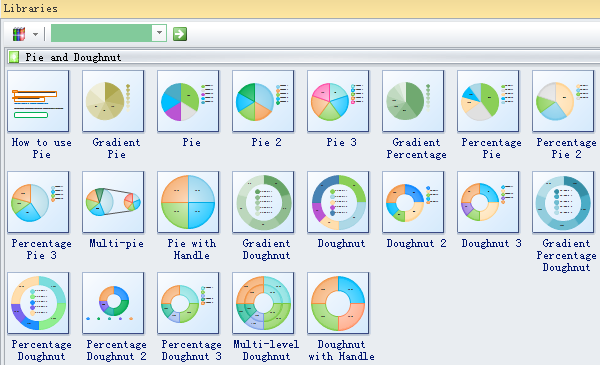 You may customize lots of doughnut chart features according to your own needs.